*Medical weight loss programs are individualized to meet the specific needs of each patient. Individual results vary. 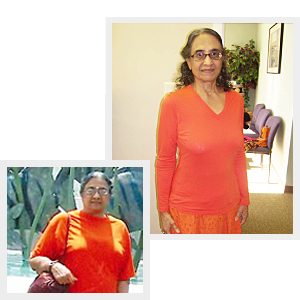 I started gaining weight after menopause when I was 55, and within 5 years it slowly reached 171 lbs. – my highest weight ever! I suffered from asthma due to pollution, had arthritis in my knees, high cholesterol and triglycerides, low HDL, hypertension and overall lacked energy. I had terrible pain in my knees all the time and had to use a cane for support while walking. I thought this was normal for a 60 year old… and that’s what aging does to people! I moved from India to the US when I was 64. My daughter was concerned about my health condition. I remember clearly the look on her face when we determined that I needed a skirt size 18! I didn’t understand why she seemed so alarmed. She started going to Learn2Lose in May 2012 and lost 40 lbs*. She urged me to try the program but I was hesitant. However, in March 2013 I went to my cardiologist, and he insisted that I had to start taking statin medication since my total cholesterol was 310, triglycerides 181 and LDL was 195. That was an eye-opener as I always dreaded taking statin. Both my sisters regularly take statin, and have had many negative side-effects. I did not want to be in the same boat as them. So I decided to change my lifestyle and went to Learn2Lose with my daughter on April 2, 2013. I was 70 years old and weighed 149 lbs. My daughter insisted that I should consult Dr. Croland, that he was wonderful and very supportive. I was pleasantly surprised and highly impressed by how friendly and encouraging Dr. Croland was. The staff was very friendly, and gave me steady encouragement and positive reinforcement. We started the program right away. As I started making dietary changes I realized that I had been consuming a very unhealthy diet and that was one of the main causes of my weight gain. After weekly nurse visits and monthly visits with Dr. Croland, with change in diet and lifestyle, I started losing weight steadily. In June, I started feeling dizzy so I monitored my blood pressure and after a few weeks, upon recommendation of my primary care doctor, I discontinued the blood pressure medication. I’ve completely given up sugar, dairy, grain, fat and oil, and I drink about 5 to 6 liters of water a day. I’ve continued to do Yoga, but now, in addition, I walk for 40 minutes every day. I sleep so much better now, no more sleepless nights! I’m full of energy, actively doing chores at home throughout the day, pursuing hobbies like painting and playing the violin, which I had previously given up because of arthritis. My knees don’t hurt when I walk and I have no use for a cane now. I feel healthy, cheerful, and peaceful. On January 7, 2014, I weighed 120.8 lbs*. and my recent blood report showed that all of my health markers improved. My triglycerides went to 126; HDL went to 71, and total cholesterol to 267 and LDL down to 171*. My blood pressure is 105/65 without medication now. Today I consume 1,000 calories and 80 grams of protein. I’m so thankful to Dr. Croland and all the staff members at Learn2Lose for their support and encouragement along my weight-loss journey. At age 71 being in such a wonderful health, and not taking any prescription drugs, was beyond my imagination! I know I’m going to remain healthy for the rest of my life! Sudha, you’re an inspiration! I’m 60 and having the same problems that you had at that age. It’s great to hear that I can be healthier at 71 than I was at 41 by following this program. Back on the stick today, after slipping a lot. I’m determined to be one of L2L’s 2014 success stories! Thank you! Very inspirational. I will be starting the program soon and I pray that I’ll have good results. Congratulations on all of your success.